Golf’s Einstein Bags Another Win! Golf’s Einstein Bags Another Win! Golf’s Einstein Bags Another Win! 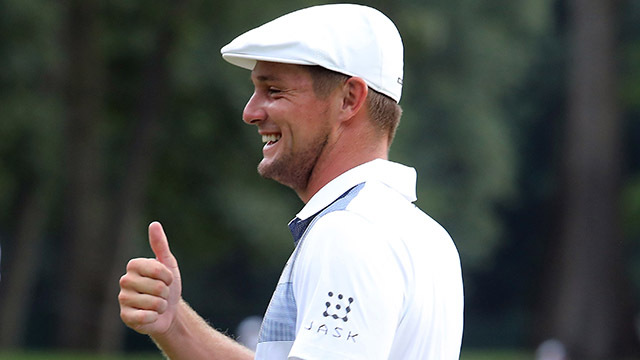 Say whatever you like but you just can’t take it away from Bryson DeChambeau (pictured)! He is different. He is charismatic. And he is totally unorthodox! Put it all together and you have one awesome golfer! Playing with one-fixed length irons, the man many refer to as a “scientist” lifted the Shriner’s tournament. The 54-hole co-leader found himself one shot behind defending champion Patrick Cantlay as he lined up a 58-foot eagle putt from the fairway at the par-5 16th in the final round. So typical of the unpredictable DeChambeau, he drained a bomb which was good enough for him to go on and win!